With the M-Audio M-Track 2X2 and 2X2M, you can create flawless 24-bit/192kHz studio-quality recordings with an intuitive and easy-to-use audio interface. This audio interface connects to your Mac or PC via a standard USB or USB-C port, providing a premium Hi-Speed USB connection combined with a USB/Direct balance knob enabling you to have zero-latency monitoring of your inputs. This article offers tips to make sure you're getting the best audio quality possible with the inputs and outputs of the M-Audio M-Track 2X2 and 2X2M. If you're a Mac user you should be able to plug the M-Track 2X2 or 2X2M into your computer and get started right away, but if you're a Windows PC user you will have to install the M-Track 2X2 or 2X2M driver first. Don't worry! This doesn't mean that your M-Track doesn't work as well on Windows as it does on a Mac. Both operating systems work beautifully with the M-Track, you just need to install the driver first for Windows to recognize the interface. Select USB Audio and MIDI Interfaces, your product (M-Track 2X2 or M-Track 2X2M), and then your operating system. 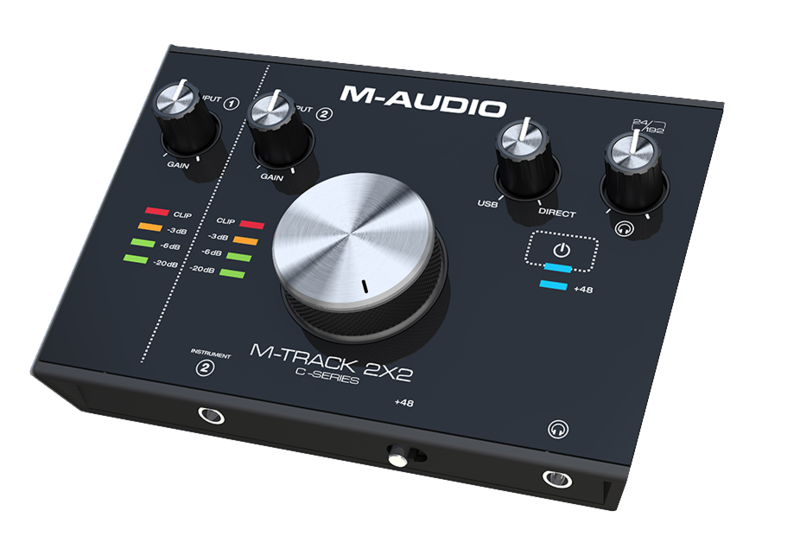 Both the M-Track 2X2 and M-Track 2X2M have a USB/Direct knob which allows you to blend how much of your input signal you want to hear with the signal from your computer. Turning the knob to the left (USB) increases the level of the signal from your computer while turning the knob to the right (Direct) allows you to hear more of what you have plugged into the inputs of your M-Track. If you're not recording and are just listening back in your music software, you may be inclined to turn this knob all the way to the left so you're only hearing your computer - DON'T! The M-Track 2X2 and 2X2M were designed to give you a strong and clear signal from your computer and turning this knob all the way to the left may overdrive the signal and cause distortion. Turn this knob a little to the right to give the signal some breathing room. Like with the USB/Direct knob, keep in mind that the M-Track 2X2 and M-Track 2X2M were designed to have a somewhat "hot" connection from your computer. Go to the sound settings of your computer and turn the output down to around 80%. This will give your output signal plenty of headroom and prevent distortion. Whether you are a customer or dealer, if you already own an M-Audio product, or if you just have pre-sales questions, the experienced M-Audio technical support team is available to help!